The Kresge Food Co-op has been a Kresge College tradition for over thirty years, supporting small farmers, the UCSC Farm Project, and the Kresge Organic Garden. 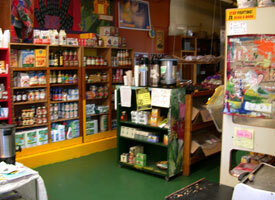 The Kresge Community Natural Foods Co-op is a non-profit student run food store located on the south side of Kresge. While anyone can buy food at the Food Co-op, members receive a discount. The Co-op operates as a collective and a variety of membership options are available. Special pricing is available on bulk orders. Come in for groceries, lunch, snacks, hot coffee, tea, or just to spend time with your friends. To contact the Food Co-op, call 426-1506, or attend the bi-weekly meetings every other Sunday at 11 am in the Student Lounge.